Soup Swap 2019 has come and gone. I’m currently unable to find online evidence but I think I attended my first swap in 2008. Holy cow! I haven’t managed to go every year but I’ve been to a lot of them. And I think there was a year or two where there was no swapping to be had because the host was working on a master’s degree. For those not in the know, Soup Swap is a gathering to boost our spirits in the heart of the winter season. All of the attendees bring six quart-sized containers filled with a frozen homemade soup/stew of their choice. If you’re really ambitions, you can bring twelve quarts and secure yourself two picks per round. All of the soups are lumped together in a spot in the room. Attendees pick out a random number, and proceed, in their numbered order, to explain what they brought in. The dear host likes to call this the “Telling of the Soup.” You can also win bragging rights for best telling. Once the telling completed, the guests then take turns, in same numbered order, picking out a new soup container to bring home. To be fair, the dear host likes to run backwards during the last two rounds. So, you bring over six quarts of your soup, and you bring home six quarts of someone else’s soup. It gets a bit competitive and a lot of strategic after the first round because there’s usually 12-14 flavors available, only 6 quarts per flavor, and some flavors are extremely popular. And true story, I’ve been enough times to soup swap that I printed out my own inventory sheet this year. This year, I made a pumpkin curry soup with black beans. My friend's annual soup swap is this week. I'm ready with my 6 quarts of soup! If you want to make the pumpkin curry soup that I did, it’s a Libby’s Pumpkin recipe. The only difference was that I added canned black beans, rinsed and drained, at the end of cooking. If you want to make six quarts of it, just multiple the recipe by 3. I will say that I think your results will heavily depend on the quality of your spices. I am personally fond of Penzey’s house curry blend. :: Did a koji and miso fermentation workshop with OurCookQuest. I really enjoyed it, and it was fun being around other food nerds. :: I’ve attended a few of this semesters Science and Cooking lectures, presented by Harvard University’s School of Engineering and Applied Sciences. So far, I’ve seen Margarita Fores, Wylie Dufresne with Ted Russin, and Vicky Lau. I’ve learned that the nipa palm looks like a torture device, and don’t make donuts unless you’re crazy. lol! :: And most recently, I attended a lunch at Juliet in Somerville, MA. It was a stop on Yvette Van Boven’s Homemade Christmas book tour. The lunch menu was inspired by the book. Both Yvette and her husband, Oof Verschuren, are wonderful people, really friendly and down to earth. I’m so glad I got to meet them both. I learned at the last Gastropod live event at the Museum of Science that Polar is 1) a Massachusetts company, and 2) releases five limited edition flavors every season. This led me to go looking for this seasons flavors. I can smell the mango, but I really only taste berries. Watermelon margarita I like. Strawberry Sunrise… just tastes like some generic fruit to me? Strong on the pineapple flavor. I decided in the end that I wasn’t into it. Raspberry Rose just tastes like raspberry to me. Oh well. First of all, what? Yeah, I’m pretty sure that’s what you’re asking yourself right now. Nüssli118° is a raw foods store in North Cambridge, Massachusetts. They sell a variety of snacks, smoothies, and juices. It’s not fancy shmancy (or is the correct description “celebrity hip”?) like Sakara Life. Their website isn’t filled with slick sounding product descriptions like Splendid Spoon (which I might try some day because they do make their soups sound very tasty!). Now, I’m not vegan or a raw foodist (I’m not even vegetarian) in any way, but I do get curious about the raw food culture. I guess it’s because I do like diversity in my meals, and healthy is always appreciated. I’ve had a some Nüssli118° products in the past. There was some sort of ginger round, chocolate pecan squares, and their chocolate cashew smoothie. All of which were delicious. So, I’ve been really curious about the Nüssli118° day tote for a few months now. The Nüssli118° Kitchen Share Day Tote is a day’s worth of delicious meals, drinks, and snacks delivered to your home or office once a week. The products are ready-to-eat right out of the mason jar or to be gently warmed, served, and savored. Either way, they will nourish, satisfy, and energize you throughout your day. Each Kitchen Share Day Tote includes 2 drinks, 3 meals, 1 savory, and 2 sweets. We look at what’s in season, combine fresh, great tasting, high quality ingredients, and create delicious nutrient-dense meals. They are all organic, plant-based, and ready-to-eat, just enjoy! If you go through my photos, you’ll notice that I didn’t get the taco salad. That’s because I’m allergic to raw celery and raw carrots. So, the store provided their mango kale salad as a substitute. You can have the soup hot or cold. It was a really nice warm spring day in Boston, so I went for it cold. I liked this meal too. The cranberries and parsley helped to jazz up the otherwise plain tasting squash soup. I might have forgotten that cashews were in the soup and topped it with a tablespoon of hemp seed from my pantry. Regarding the snacks, this is where Nüssli118° really shines. No surprise, the super dark chocolate rounds were my favorite from the tote. The rosemary crackers were a close second. The lemon ginger squares were my least favorite only because it’s a little too sweet for my personal preference. But the texture is great. It’s got crunch from the nuts but it’s not hard on the teeth. The brightness of the lemon flavor shines through, but I’m not sure I could taste ginger much. At the end of the day though, I’m always pro-chocolate. The rounds are quite dense, but the chocolate flavor satisfies quite nicely. Finally, I had the chia pudding for breakfast the morning after I picked up the tote. I was unsure if I was going to like it. Generally, I stay away from chia seeds because they get stuck in my teeth too easily. Maybe because I had let the chia pudding sit for so long, I didn’t really have an issue. It would have been boring if it hadn’t been for the fruit topping – apples, kiwi, and oranges – even though the pudding says it was spiced with cinnamon, ginger, cardamom, clove, and nutmeg. I could tell that the pudding wasn’t just chia, cashews, and water. However, the spices were really muted. As for the drinks? The cashew vanilla smoothie was good. Not the best I’ve ever had, but certainly not the worst. It’s just a basic cashew smoothie. The tote list says vanilla chai, but the bottle I had was just vanilla. The ingredients were water, cashews, dates, coconut oil, vanilla, and Himalayan salt. The pineapple turmeric was probably my least favorite thing in the whole tote, and that’s just personal preference. I found the turmeric flavor to overpower every other flavor. The ingredient list is pineapple, water, mango, orange, lemon, maple syrup, turmeric, and cayenne. I could barely taste the pineapple. I really couldn’t taste any mango or orange. Disclaimer – This post was not sponsored in any way. A family member purchased the tote for me as a gift. I just wanted to share my excitement. I went to Trader Joe’s yesterday. I picked up a couple of things that I hadn’t seen before and so far like. Tastes like taste no. 5 umami Bomba paste. I approve. But much more affordable than buying Taste No. 5 Bomba paste… since that gets imported from England. I’m tempted to stock up on this out of fear. I hope TJs never stops making this! It’s a smidge sweeter than I like. Not really a surprise, since sugar is the first ingredient, but it’s much tastier than buying hot cocoa packets. Deacon Giles was fully operational and open on weekends to the public at the end of October, but I didn’t have a chance to visit them again until today. Everything looked great. I could not be happier for founders Ian and Jesse. There were glasses on the table with aromatic samples of the herbs and spices that went into the gin. I’m not sure if I can remember them all, but I remember: juniper, lemon peel, orange peel, cardamom pods, angelica root, rosehips, and mace. Above: The “Chief Alchemist” pouring tasting samples to guests. Deacon Giles rum and gin are slowly making their way into Greater Boston. So far, they have a decent distribution around the North Shore area. If you ever visit Salem, MA, I highly recommend visiting the distillery too! If you head over the 75 Canal Street in Salem, Massachusetts, you’ll find a car transmission place and a day care center. Not very exciting stuff, I’ll admit. However, if you pop your head around the Gardner Street corner, you’ll find that the building also houses the upcoming Deacon Giles Distillery. I got the opportunity to check out the distillery as construction is still being finished. Simply put, I think wonderful things are in store for its future. 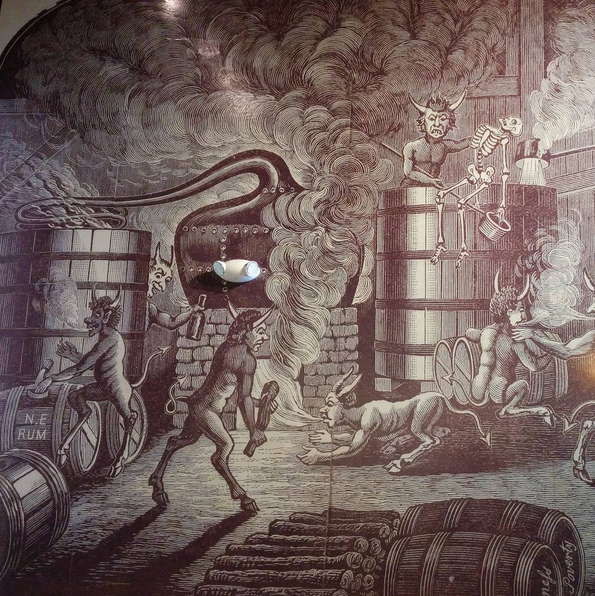 One of the walls of the tasting room features an illustration from The Dream, or, The True History of Deacon Giles’ Distillery and Deacon Jones’ Brewery: Reported for the Benefit of Posterity, which is the inspiration for the distillery name. And the tasting room is very cozy! Co-founders Ian and Jesse have worked really hard on it. It features a lot of gorgeous salvaged wood. If you look very hard, you can see that we got to taste samples of the gin which had been made in a small tester batch. 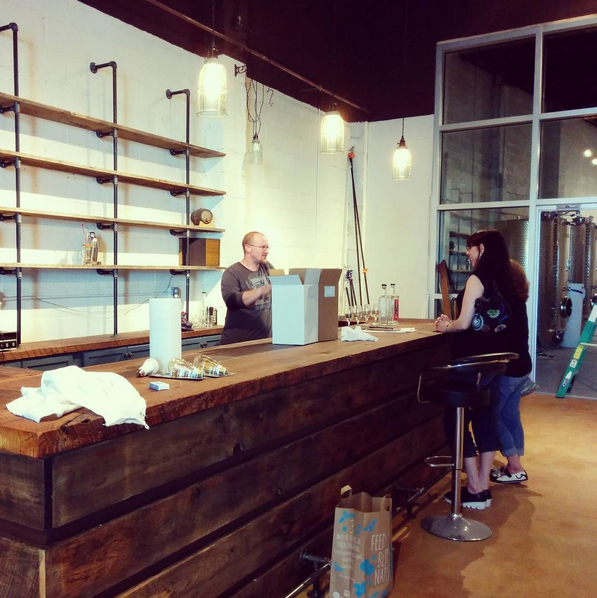 The still hasn’t made its way to Salem yet (but it’s en route!) so mass production is on hold. I don’t even drink, and I have to say that it was a pretty fantastic gin. I can also tell you that the other product is rum, and it’ll be made with molasses. 100% molasses. No cane sugar. The distillery hopes to open in October, and I hope so too! Ian and Jesse are a couple of really nice guys with a dream and a whole lot of determination. I plan to have a follow post when everything is open to the public.